Every watch company nowadays has connections with some field of adventure or sports. Longines has horseracing, Omega has the Olympics and Rolex has the Grand Prix however there are very few of these connections that have a historical precedent. One of these genuine connections is between Breitling,the Navitimer and aviation. It is an undeniable fact that Breitling has genuine ties to the field of aviation as the company started out as a manufacture of chronographs and timers for pilot's dashboards before branching into wristwatches. Released in 1942 the Breitling Chronomat was one of the first wristwatches to have a slide rule allowing mathematical calculations to be made making it very popular with pilots. It was the immense popularity of the Chronomat that led Breitling to create a true navigational timer watch, the Navitimer. The problem with talking about the early history of the Navitimer is that a lot of the records do not exist anymore. Breitling went through a dark time when they almost were wiped out during the quartz crisis of the late 70s and most of the early records were lost. 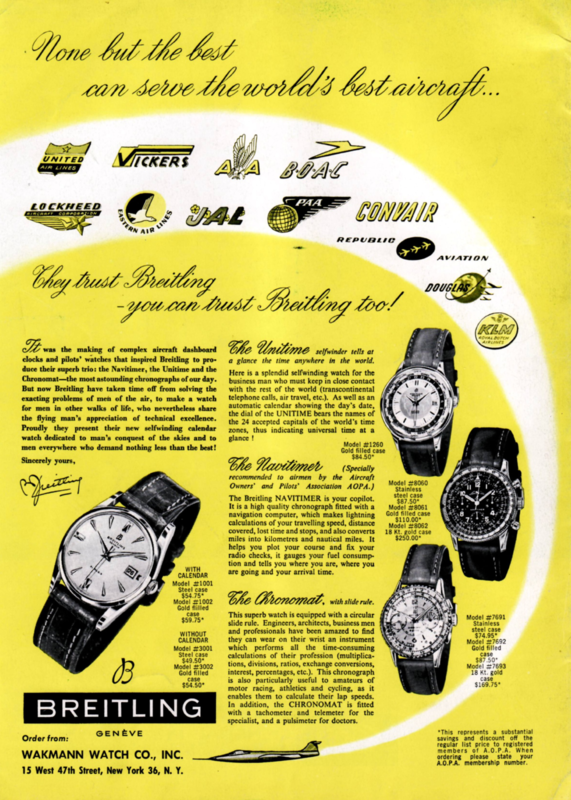 Even the launch year of the Navitimer is contested as Breitling says 1952 however some experts say 1954. Some believe the watch was created at the behest of the Aircraft Owners and Pilots Association (AOPA) which is why most early models feature the AOPA logo whilst others claim the Navitimer was created solely by Breitling and AOPA approached them after the fact to have their logo on the dial . 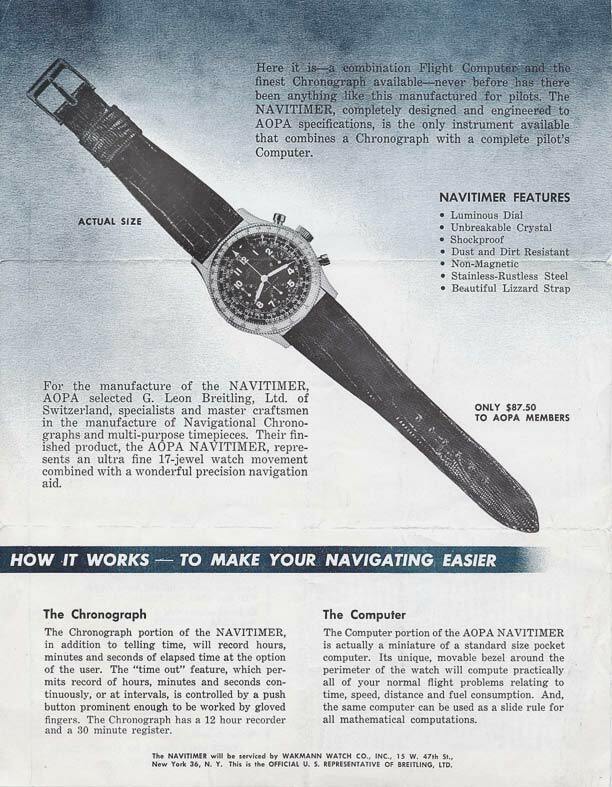 An old AOPA brochure (date unknown but pre-1963) claimed that "the NAVITIMER, completely designed and engineered to AOPA specifications, is the only instrument available that combines a chronograph with a complete pilot's computer". This statement could be interpreted either that the watch just happened to meet the standards already set by AOPA or that the watch was was tailor made to fit those standards. Unfortunately the advertising of the period played pretty fast and loose with the truth so it's probably we'll never know for sure. Even the serial numbers don't help much as some experts believe that serials that are claimed to be from the early fifties are actually from the early sixties. Some claim that the original watches were powered by a Venus 708 movement which was eventually replaced by a Valjoux 7740 in the sixties but other say that a Valjoux 72 was used as early as 1954. What is amusing about the early days of modern watchmaking is that it really was the Wild West. Dials could get misprinted, a different set of hands might be used, a serial or reference might be missing, all of which is almost unthinkable in the computer assisted workshops of today. The oddities and rejects of fifty years ago are the most desirable pieces of today. What I didn't know till recently was that the Navitimer is the oldest chronograph watch that is still available and has been in continuous production since it's creation. Thinking back to other famous chronographs, the Carrera and Dayona from 1963, the Speedmaster from 1969, I wouldn't have gone straight to the Navitimer as the oldest. What I think has held back the Navitimer from being as iconic as other watches of the period (along with the lack of records) is that it never really had a famous wrist associated with it. Newman had the Daytona, Armstrong had the Speedmaster and depending on who you ask McQueen had the Submariner (Correct answer), the Monaco (Really only for filming Le Mans) or the Explorer II (Wrong. Wrong. Wrong). However the Navitimer was on the wrist of probably the most famous jazz musician ever, Miles Davis, who wore the watch from the early sixties to his death. Whilst he is a legend in his field, Miles Davis' obsessive, aggressive, erratic persona is not one that any company wants associated with their brand. There have been countless iterations of the Navitimer over the years with complications added and taken away. There was even a run of digital navitimers in the early eighties which have more in common with the current line of Breitling Professional Series. Yet throughout all the variants there has always been a slide rule no matter the size or shape of the watch. If you want an amazing in-depth history of Breitling and the Navitimer then please click here or for a great interview with two of the most knowledgeable Breitling collectors then click here. The Navitimer World is slightly larger in size than the original Navitimer, that at 42mm and the World at 46mm. There is no hiding the increase in size but considering that Breitling pieces can stretch to 50mm, 46mm is relatively restrained. The watch is 15mm in height so it won't be slide underneath a shirt cuff with ease, it has a much lower profile that the width would lead you to expect and sits comfortably on the wrist. The Navitimer World is actually 2mm smaller than the recent Navitimer GMT. What is the difference between the two? The GMT is powered by the Breitling manufacture Calibre BO4, an in-house column wheel chronograph GMT movement, is 48mm and has sapphire crystal caseback. The Navitimer World is powered by the Breitling Calibre 24, an altered ETA Valjoux 7750 with an additional GMT Module, is 46mm and has stainless steel caseback. The two can be differentiated by the World's alternative chronograph dial layout of 12, 6 & 9 as opposed to the more traditional 3,6 & 9 of the GMT. This different layout doesn't lend the watch to dial symmetry as the logo and date have been shifted to 3 o'clock but the watch remains perfectly legible regardless. The addition of a GMT function to the Navitimer seems like a perfect fit in my eyes. From conception the watch has been designed for practical use and the GMT is one of the most useful complications for travelers and pilots. The short red tipped GMT hand rotates around the dial once every twenty-four hours and is adjusted by the crown rather than a pusher like my Zenith Captain Dualtime or a push piece like some Longines or Omegas. The gold numerals of the second time zone are noticeably different than the white font of the slide rule however I would have prefered it to be slightly larger or a bolder color for better at-a-glance visibility. 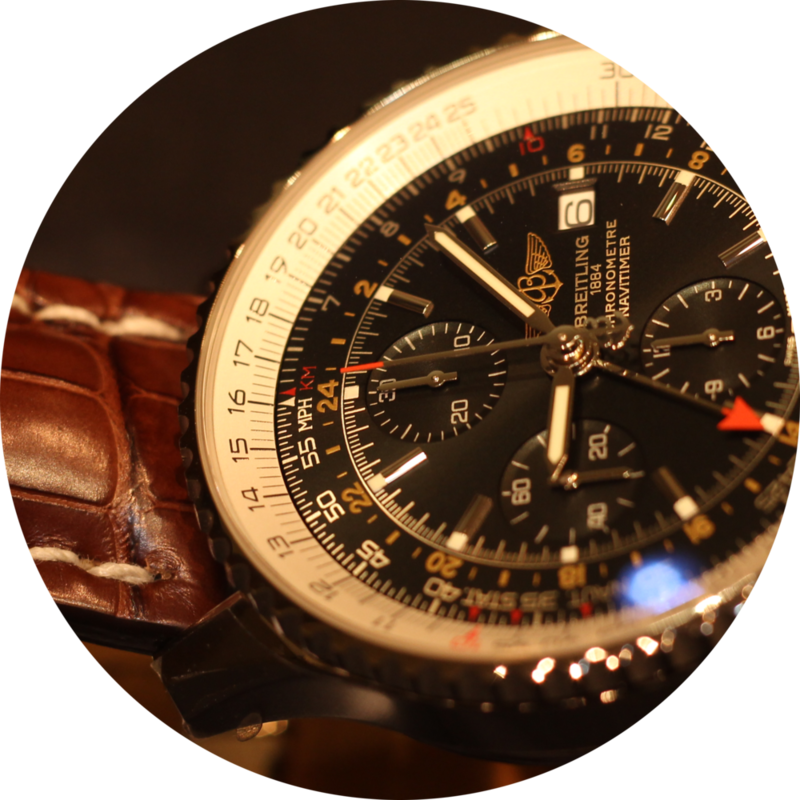 Like all Navitimer watches, the World has a slide rule bezel that allows calculations to be made on the fly. There are additional gaskets that are underneath the slide rule that preserve the water resistance. Whilst I was to be able to once rattle off all the calculations that can be done with the watch, I was never able to actually remember how those were done. Simple conversion from miles to kilometers were easy enough but anything more advanced and think most would find themselves reaching for a phone. But a Navitimer without a slide rule isn't a Navitimer. Like the tachymetre, it acts as a nice reminder of a simpler time when the Navitimer was the most advanced Smartwatch on the planet. 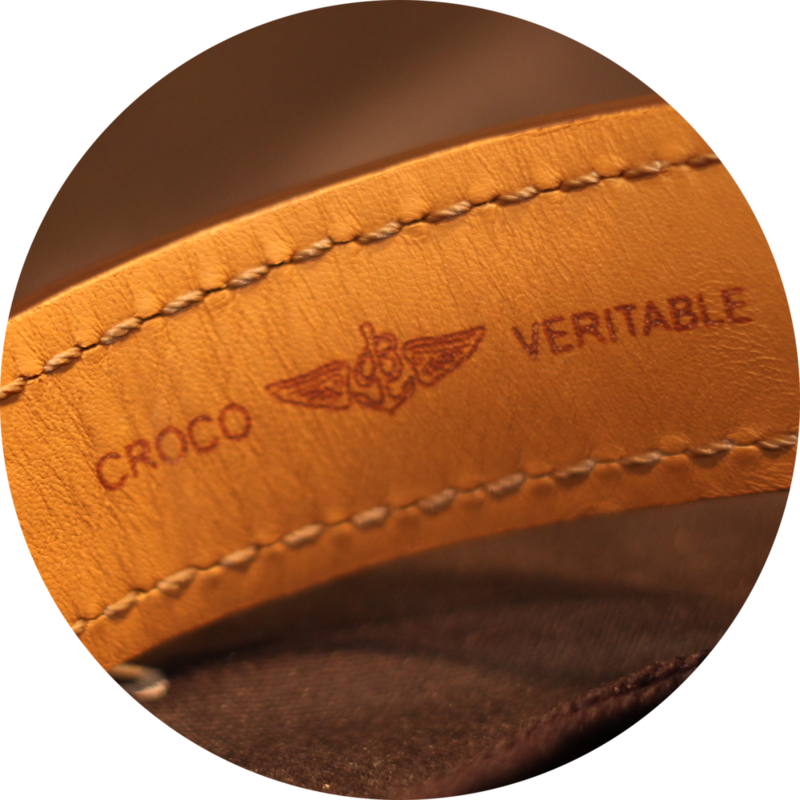 The Navitimer World I spent time with was fitted onto a brown crocodile strap with a deployment buckle. I'm a fan of mixing brown straps with black dials but I know there are some people out there who think it's a real no-no. There are three dial color options (Black, white and blue) along with three choices of straps (black leather, brown leather and the Navitimer bracelet) so whatever your preferences there will be a model for you. If you have time to kill on a lazy Friday afternoon at work I heartily recommend the tool of the Breitling site which allows you to customize a watches dial, hands, case, strap etc. I mostly use it to create watches that are equally offensive to the eyes as they are to the wallet but I'm sure someone in the market for a watch will find good use for it. I really like this watch as even after fifty two (or four) years the Navitimer still feels as fresh today as it did then and the addition of the GMT complication seems right at home. The Navitimer World is cheaper than the GMT yet still is a chronometer rated watch with top quality Valjoux movement inside. What more could you want? If you'd like to receive weekly updates for all articles published then sign up to the Timepiece Chronicle newsletter. The Graham Chronofighter Nose Art is a fascinating watch with its left hand chronograph layout and beautiful pin-up girl design. It's as simple as this; the Junghans Meister Hand-Winding is an amazing watch and you should have one. The Junghans Form A is the latest watch from the German brand and it's opening up watch collecting to a whole new market.